While Congress was the single-largest party in Meghalaya with 21 seats, NPP leader Conrad Sangma was sworn-in today as the chief minister. After high drama on Sunday, NPP's Conrad Sangma was sworn in today as Meghalaya Chief Minister. Shillong: In Meghalaya, the National People's Party or NPP leader Conrad Sangma took oath this morning as the Meghalaya Chief Minister. The Congress under the leadership of Mukul Sangma on Sunday had said it is the single-largest party to get votes and that it should be invited to form government in Meghalaya. The Congress was 10 seats short of the halfway mark at 31. However, Conrad Sangma's NPP with 19 seats got support from its ally BJP and other regional parties. In Tripura too, BJP with its ally IPFT is all set to form the government with Biplab Kumar Deb as the chief minister. Three people have been arrested over the last 48 hours in Tripura, for what the police has described, as "post-poll' violence. A Lenin statue, situated in the middle of Belonia town in south Tripura, was razed by bulldozers. Eyewitnesses claimed bulldozers, allegedly brought in by BJP workers, demolished the statue amid chants of "Bharat Mata Ki Jai", according to reports. Read the full story here. Earlier this morning, Conrad Sangma, the 40-year-old chief of the National People's Party (NPP), took oath as the new chief minster of Meghalaya at the head of a five-party coalition. Eleven other ministers also took oath with him. Read here. Biplab Kumar Deb will be Tripura Chief Minister, says BJP. Jishnu Deb Burman will be his deputy. PM Narendra Modi is likely to attend the oath ceremony. As Amit Shah entered the Rajya Sabha, of which he is a member, he took a Tangkhul Naga haora muffler and draped it around his neck. BJP lawmakers and ministers in the upper house greeted him with loud cheers and thumping of desks. 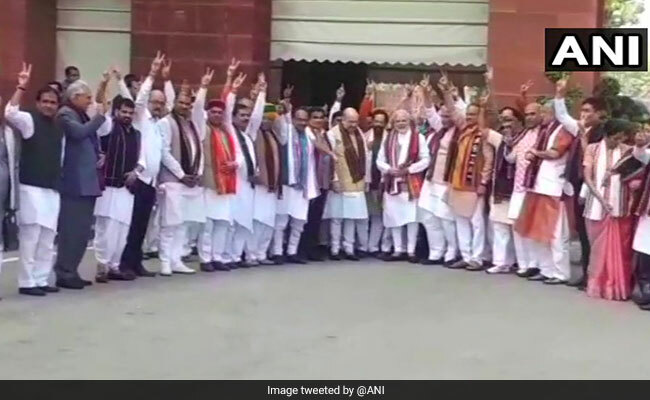 BJP lawmakers and ministers celebrated the party's latest election victory by wearing scarves in the colours of the Northeast in Parliament on Monday. 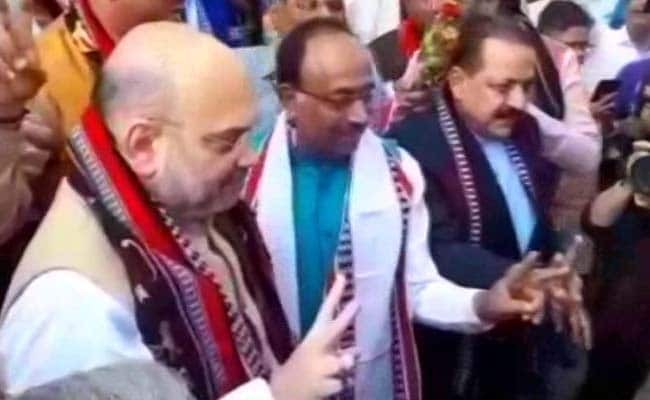 As Prime Minister Narendra Modi arrived in parliament, BJP chief Amit Shah presented him with a traditional Naga scarf and then a large party contingent posed with beaming smiles and holding up the v sign for victory for photos near the PM's office. Legislators of the BJP and the IPFT will meet in Agartala on March 6 to elect their leader, Tripura BJP president Biplab Kumar Deb said today. The BJP has 35 legislators and the Indigenous People's Front of Tripura has eight. Union minister Nitin Gadkari will be present at the meeting, Mr Deb said. The newly elected legislators of the alliance partners NDPP, BJP and others will meet today to elect senior NDPP leader Neiphiu Rio as their leader. 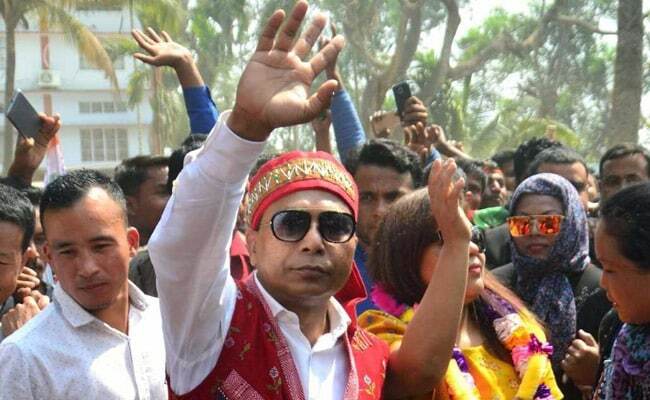 Nationalist Democratic Progressive Party secretary general Abu Metha said the coalition is proposed to be named the People's Democratic Alliance. "The first sitting of MLAs of the alliance partners would be held tomorrow (Monday) to officially elect Rio as the leader," Mr Metha said. 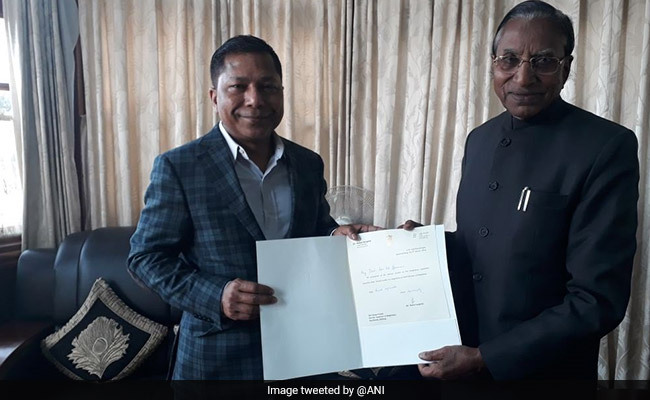 Meghalaya Chief Minister Mukul Sangma has resigned today, a day after the Congress failed to secure majority in the assembly election. 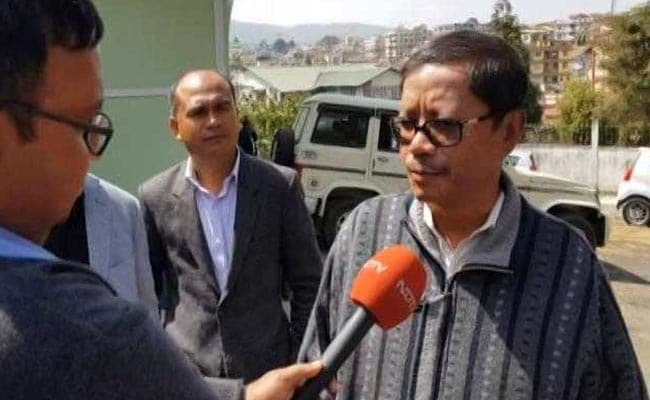 The governor has accepted his resignation and asked Mr Sangma to be in charge till a new government is formed, a Raj Bhavan official said. "Since the whole election process is over, the chief minister has to submit his resignation and I did. Further course of action will follow as per convention," Mr Sangma told news agency PTI. Himanta Biswa Sarma, the BJP's main strategist in the northeast who stitched up the brand-new coalition in Meghalaya, took a sharp dig at the Congress and its chief Rahul Gandhi for what he called was their immature handling of the job at hand. "I think they have faltered in their judgment," Mr Sarma told NDTV. "The top-most priority is the Naga political issue. People want peace. And when peace comes, development will happen. You remember when I was CM, we fought the underground together. We have to give a push to the Naga issue. PM Narendra Modi had signed the Naga Framework Agreement... negotiations are going on. When people are united, the solution will come. The people support the BJP and also my party. I am grateful to the people. We are happy that we are going to have a strong and stable government to take up big issues and development agenda. I am inviting him (PM Modi) in the swearing in ceremony." "Like-minded parties had a common interest. All parties came together to work under an alliance. It's not about help from BJP. They are part of the alliance. There is a large anti-incumbency against the last government. Most parties who fought the election was against the last government." 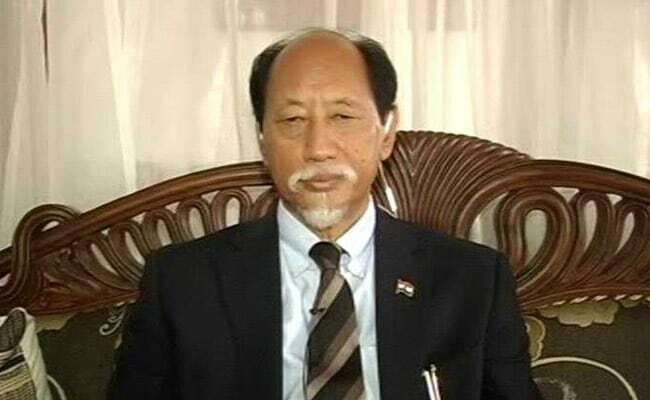 The National People's Party met Meghalaya Governor Ganga Prasad and staked claim to form the next government in the state. The NPP, which secured 19 seats on its own, has the backing of six United Democratic Party (UDP) legislators, four People's Democratic Front (PDF) MLAs, two each from the Bharatiya Janata Party (BJP) and Hill State People's Democratic Party (HSPDP) MLAs and an independents, taking the combined strength of the alliance to 34. This leaves the ruling Congress, despite retaining 21 seats, lagging in the numbers game. Congress's Mukul Sangma later taunted the BJP for attempting to form the government with just two members. 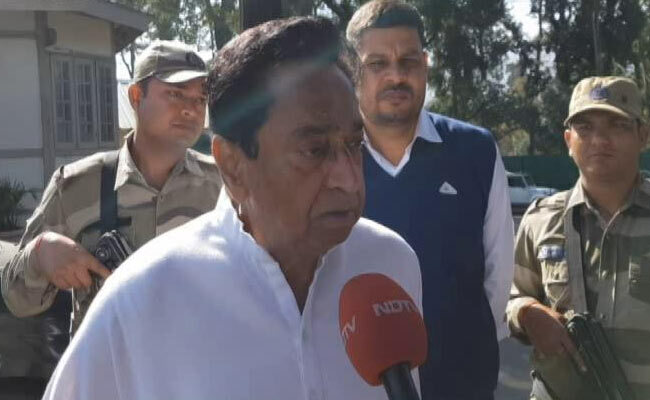 "They want to fire from the shoulder of other political parties," the outgoing chief minister told reporters after submitting his resignation from the post. Conrad Sangma, who was earlier said to reluctant to be projected as his party's presumptive chief minister, said he agreed to assume the responsibility on the insistence of the coalition partners. He is the son of former Lok Sabha Speaker PA Sangma who founded the NPP that is now run by the Sangma family. "We don't have pre-poll alliance with anybody. Right from the time of campaigning we knew that BJP, NPP and UDP were together and it has been proved now. Mandate was actually given to Congress." "In Meghalaya, non-Congress government of NPP-UDP-BJP will take oath on 6 March. To be followed by Nagaland and Tripura on 7 and 8 March." "Currently we have 34 members, NPP 19, BJP 2, UDP 6, HSPDP 2, PDF 4 and one independent. The number is likely to go up. Rahul Gandhi sent four senior leaders of the party to Shillong, without any calculations on government formation. I don't see maturity in him,"
"It's positive that regional parties got together to work for the region. It's people's decisions and we need to respect that." "Happy to share that 34 newly-elected members belonging to NPP, UDP, PDF, HSPDP, BJP and one independent member are meeting the governor to stake claim to form government in Meghalya. Conrad Sangma will be the leader of this coalition." "The next two-three days are very crucial because the assembly's term will end. The house expires on March 7. Before that, everything has to take place and by tomorrow everything will be clear." "We will bring transparency. We are concerned about development and will focus on implementing central schemes. It's not about being the single-largest party; it's about having the majority." 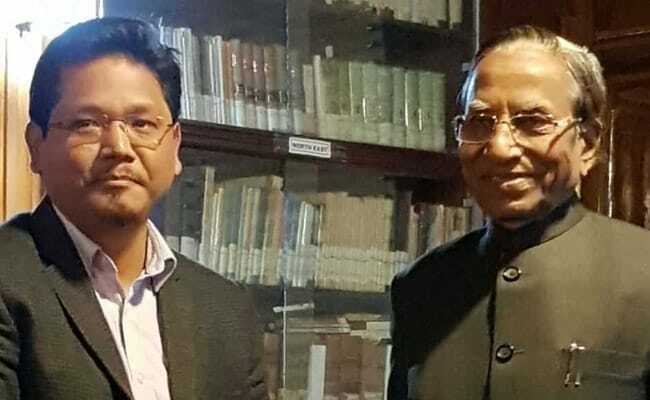 National People's Party or NPP leader Conrad Sangma meets with Meghalaya Governor Ganga Prasad to stake claim to form government. Oath-taking on March 6: news agency ANI. 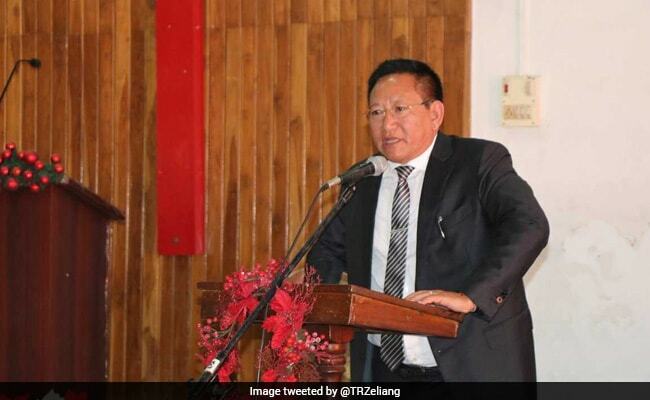 Nagaland Chief Minister TR Zeliang, who heads the Naga People's Front or NPF that won 29 seats along with its ally in the assembly election, said he will not resign. Mr Zeliang said he would meet with BJP president Amit Shah in New Delhi to discuss government formation in Nagaland. NPF chairman Shurhozolie Liezietsu has written to Amit Shah, saying they were "still friends". The United Democratic Party that won six seats in Meghalaya assembly elections and could get to decide who forms the next government in the state suggested that it would support the political formation that is able to provide "a stable government. Himanta Biswa Sarma and Donkupar Roy of the UDP are meeting inside Dr Roy's house. BJP's Kiren Rijiju along with Himanta Biswa Sarma and Congress's Mukul Sangma reaches United Democratic Party headquarters in Shillong. Kiren Rijiju: BJP parliamentary board has sent me to communicate to the UDP that we are with them and will support the formation of a non-congress government in Meghalaya. Senior BJP leaders meet leaders of regional party in Meghalaya. BJP leaders and union ministers Kiren Rijiju and KJ Alphons meet with leaders of UDP. Kiren Rijiju tweets: Newly elected MLA Shri A.L. 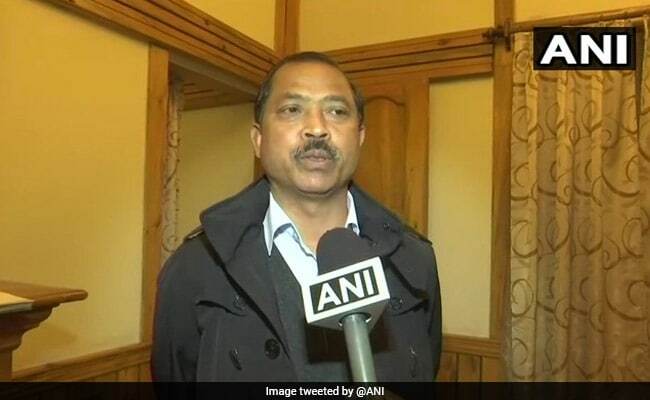 Hek is declared the Leader of BJP Legislature Party in Meghalaya Legislative Assembly. Independent lawmaker Samuel M Sangma meets Himanta Biswa Sarma at Assam Bhawan in Shillong. A day after Holi,the results of Northeast elections again created an environment of festival. You must think why I am discussing it here. I'm not seeing it as victory and defeat of political parties, significant is that entire nation was involved in Northeast's celebrations:PM Narendra Modi. If NPP has 19 MLAs, will they stick together? The BJP's Himanta Biswa Sarma and Alphons Kannanthanam are likely to meet the governor at 1 pm today for a courtesy call. 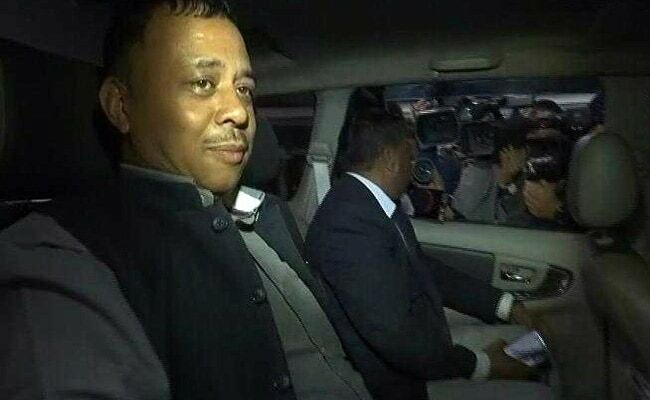 Faced with the prospect of being pipped by regional parties, the Congress, which emerged as the single largest party in a hung Meghalaya verdict, met with Governor Ganga Prasad late last night, staking claim to form government. There are clear guidelines in place that say that the single largest party should be called first.